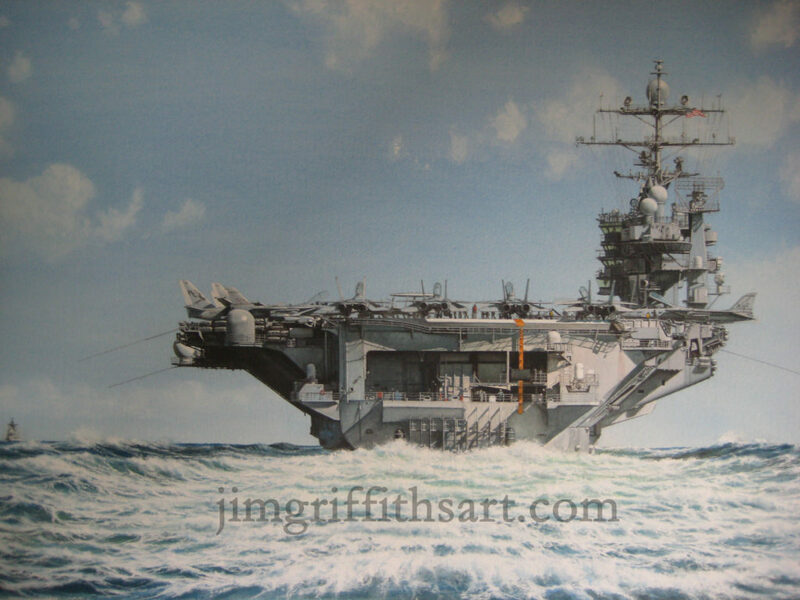 "Instrument of Policy", 19 1/2 x 31”, USS Harry S. Truman, CVN-75, heading for the Persian Gulf, December, 2004; SOLD. 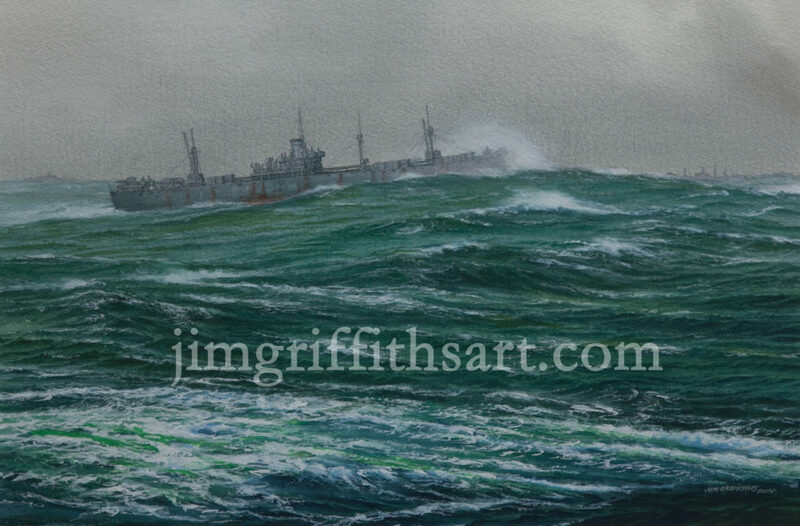 "Across the Sea of Storms", 12 1/2 x 19", U.S. Liberty Ship in No. Atlantic - 1943, Collection of the artist. "Eldorado in the Pacific", 12 1/2 x 19", USS Eldorado (AGC-11), January, 1945, Collection of the artist. 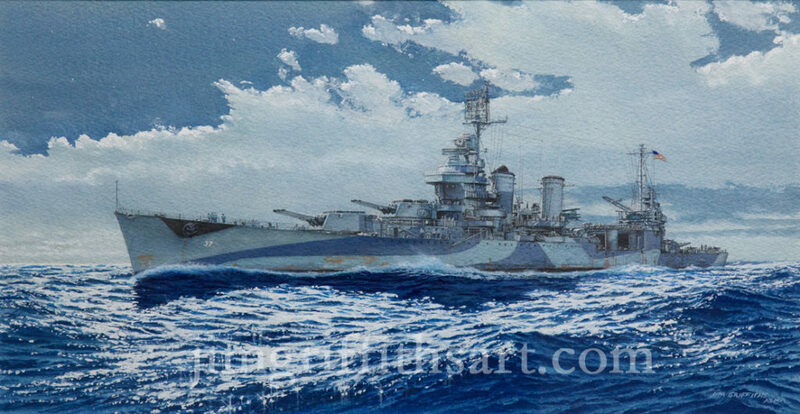 Always Pushing Forward, 121/2 x 19,"USS New Mexico (BB-40), Nov., 1944, Collection of the Artist. 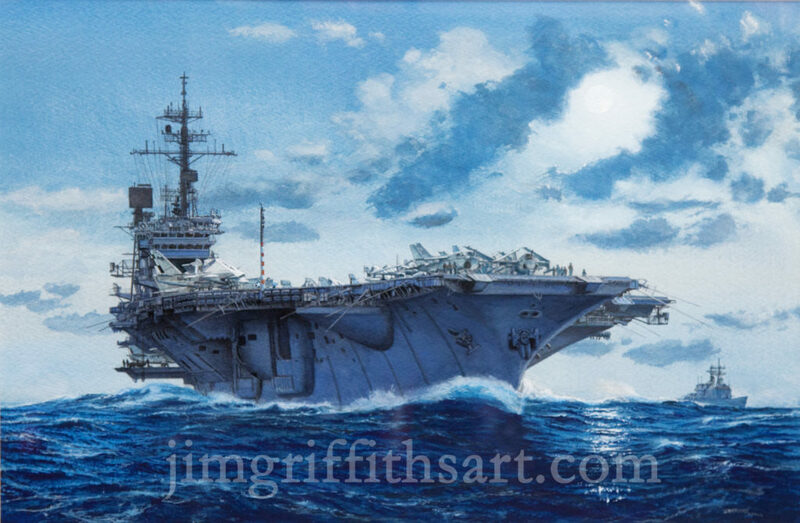 "Always Ready," 12 1/2 x 19," USS America (CVA-66), mid-1980s, Collection of the artist. 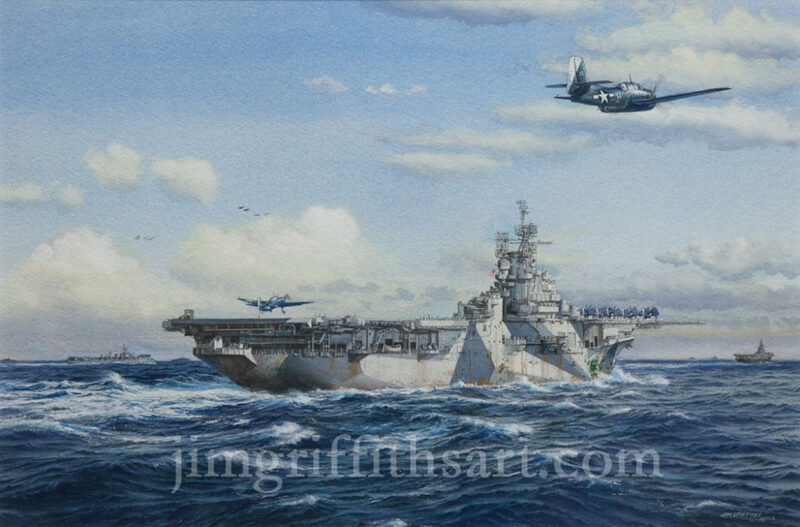 "Back From the Hunt,"12 1/2 x 19," USS Block Island (CVE-21) and VC-55 a/c, 1944, Collection of the artist. 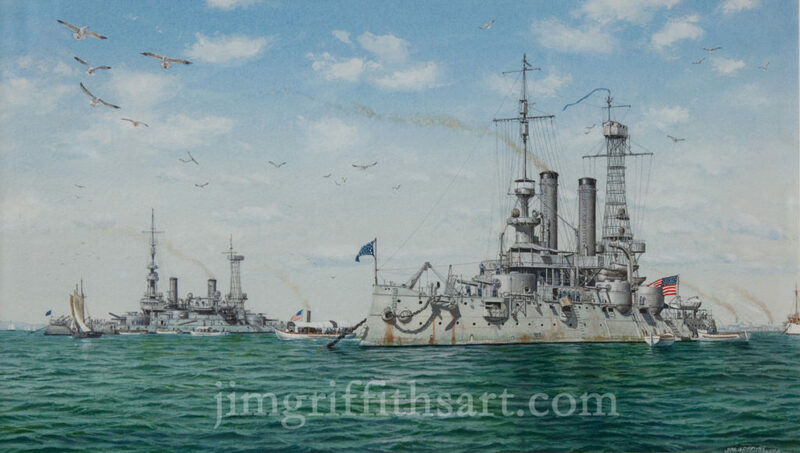 "Battleship Grey," 11 1/2 x 20", USS Iowa (BB-4) and USS Massachusetts (BB-2), 1911, Collection of the artist. 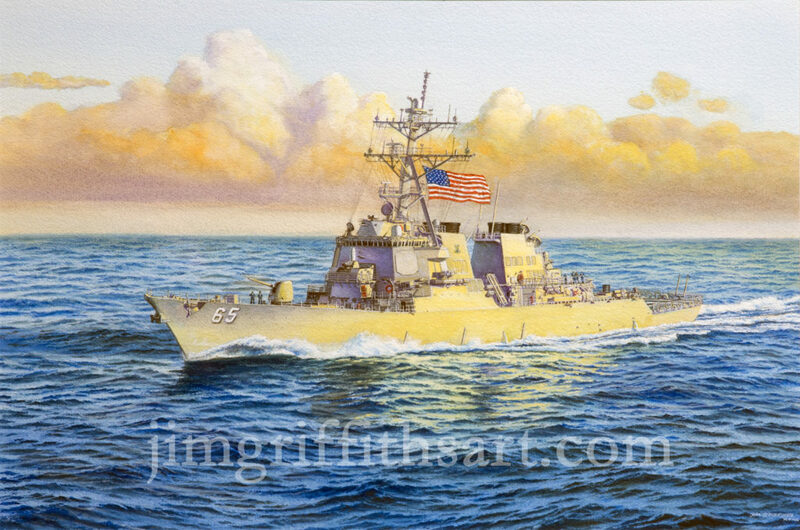 "USS Benfold in the Gulf", 16 x 24”, USS Benfold (DDG-65), in the Persian Gulf, 1997-98; SOLD. 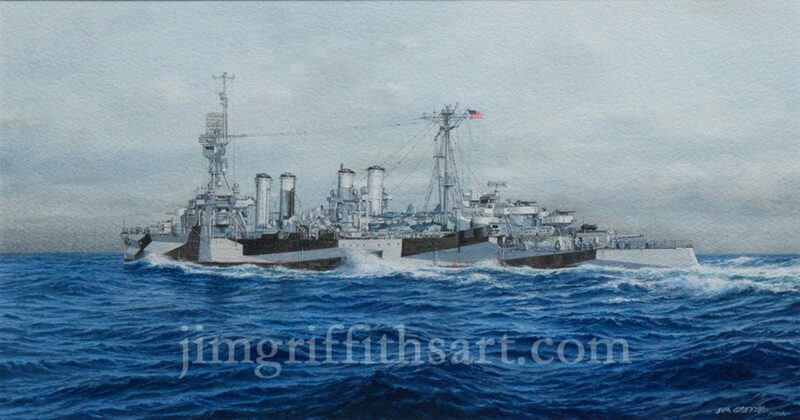 "Bound for Lingayen Gulf," 11 1/2 x 27", USS Louisville (CA-28), January, 1945, Collection of the artist. 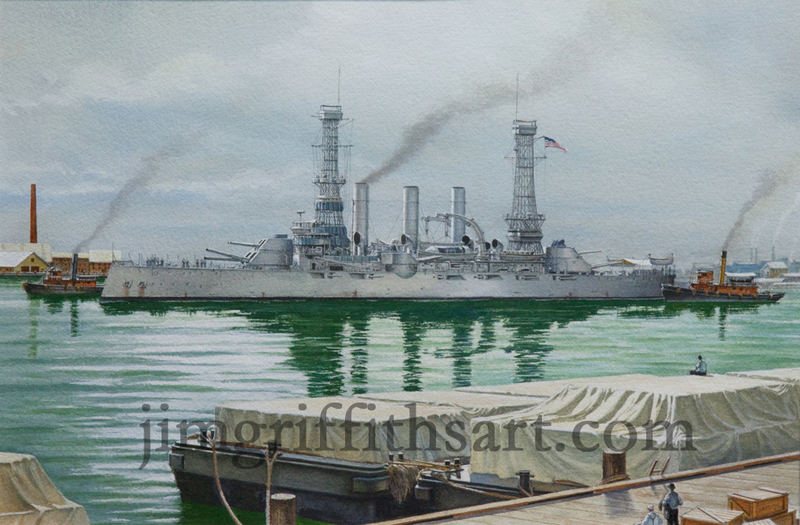 "Changing to Peacetime Grey", 8 x 19”, The USS Stanley (DD-478), dockside, Autumn, 1945, being repainted in post-war Haze Grey, Collection of the artist. 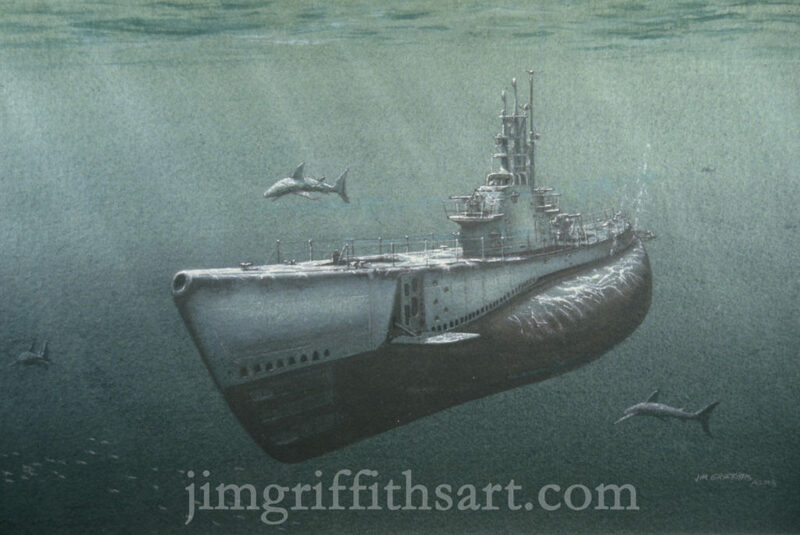 "Clear to Port/Clear to Starboard," 12 1/2 x 19", Permit-Class Sub, mid-1990s, Collection of the artist. 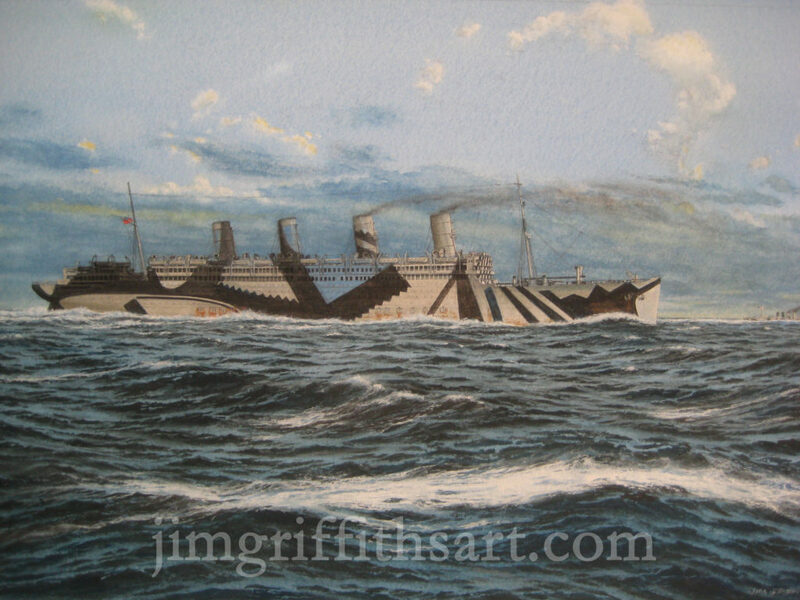 "Dawn in the Western Approaches," 12 1/2 x 19", RMS Aquitania, 1918, SOLD. 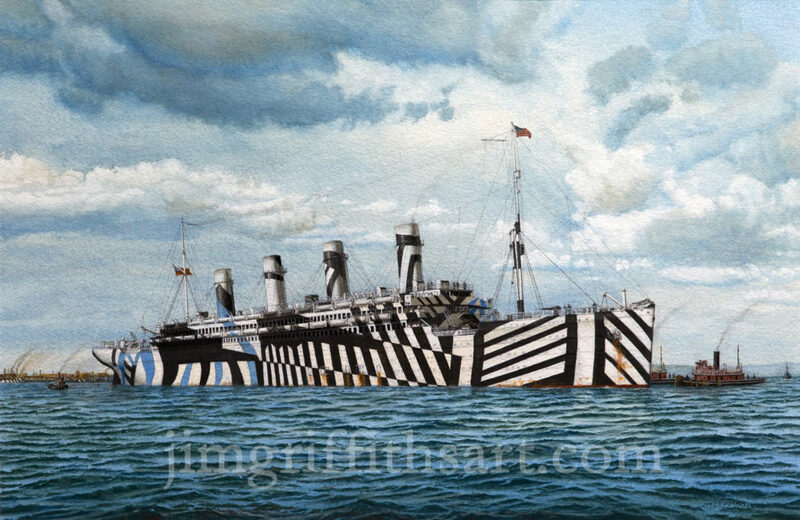 "Dressed for War," 12 1/2 x 19", RMS Olympic, 1918, SOLD. 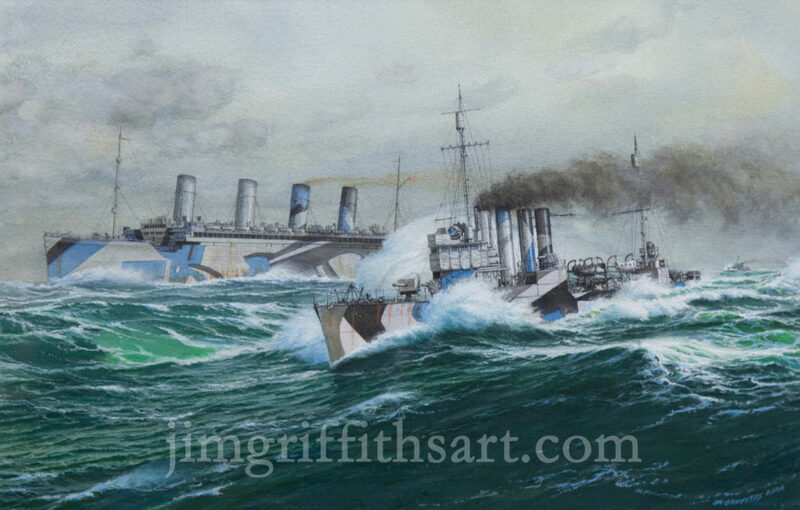 "Escorting the Olympic", 12 1/2 x 19", WWI USN Destroyers Escourt Olympic, Winter, 1918, SOLD. 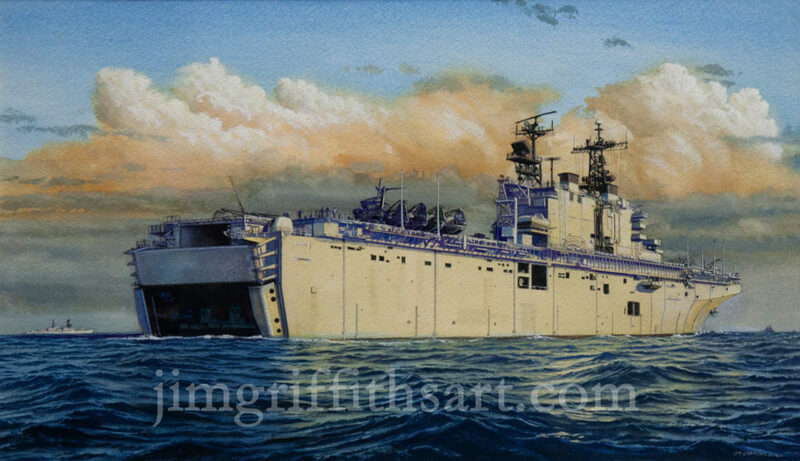 "Eternal Father, Strong to Save", 12 1/2 x 19”, Mars-class combat stores ship, USS San Diego, AFS-6, in heavy weather, SOLD. 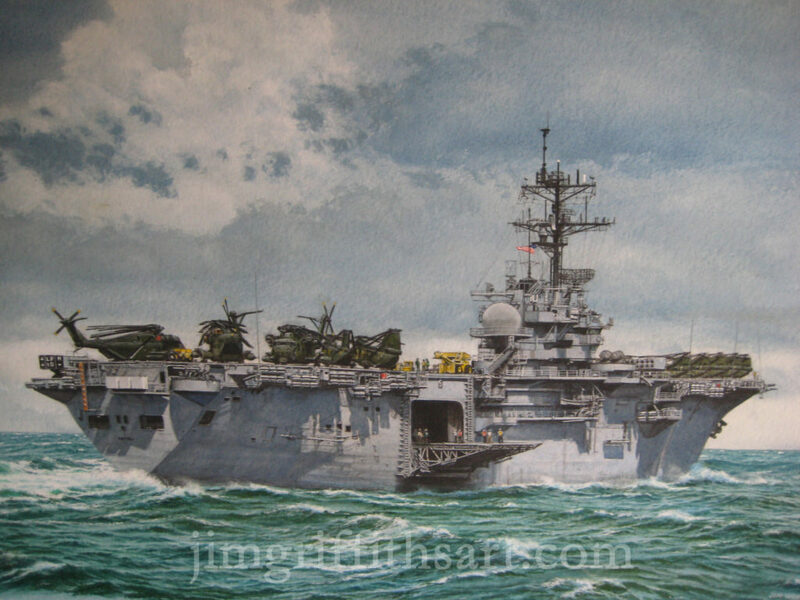 "First to go in Harm's Way",12 1/2 x 19", USS Tripoli (LPH-10), Mid-to-Late 1980s, SOLD. 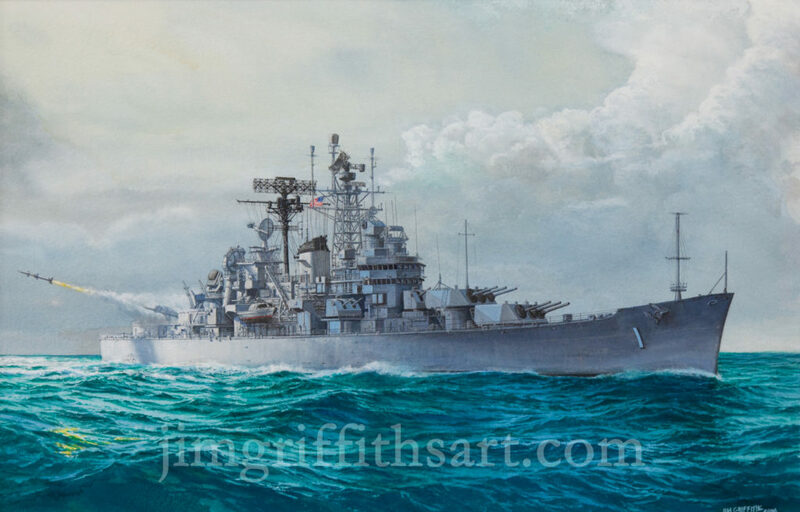 "Into the Missile Age", 12 1/2 x 19”, USN guided missile cruiser USS Boston, CAG-1, circa 1964-65, Courtesy of the Jinishian Gallery. 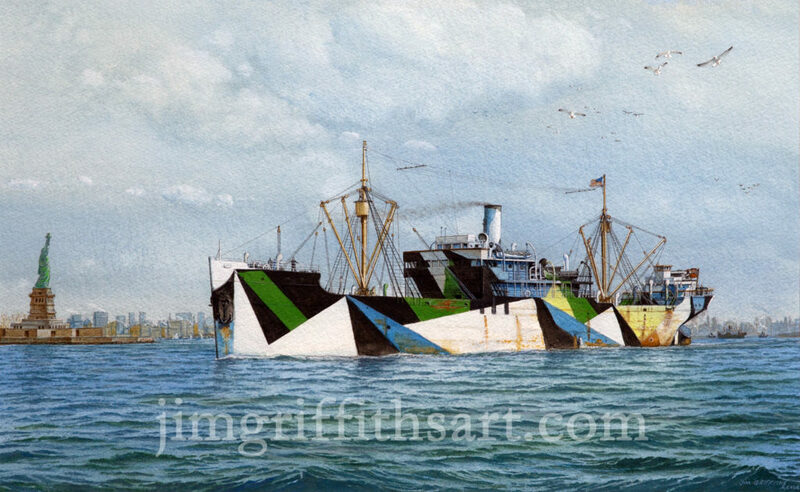 "Like a Coat of Many Colors", 12 1/2 x 19”, British freighter SS Edward Wadsworth, in dazzle camouflage, departing NYC, winter 1917-18, Courtesy of the Maritime Gallery at Mystic Seaport. 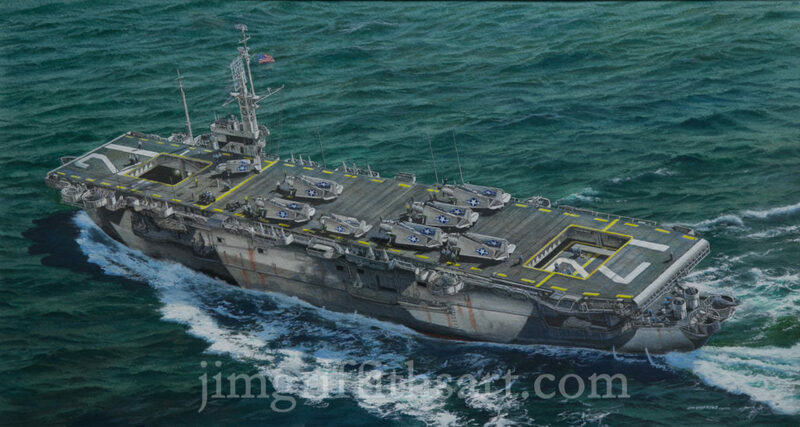 "Getting Everybody Back Aboard", 11 x 19 1/2", USS San Jacinto (CVL-30), Oct, 1944; collection of the artist. 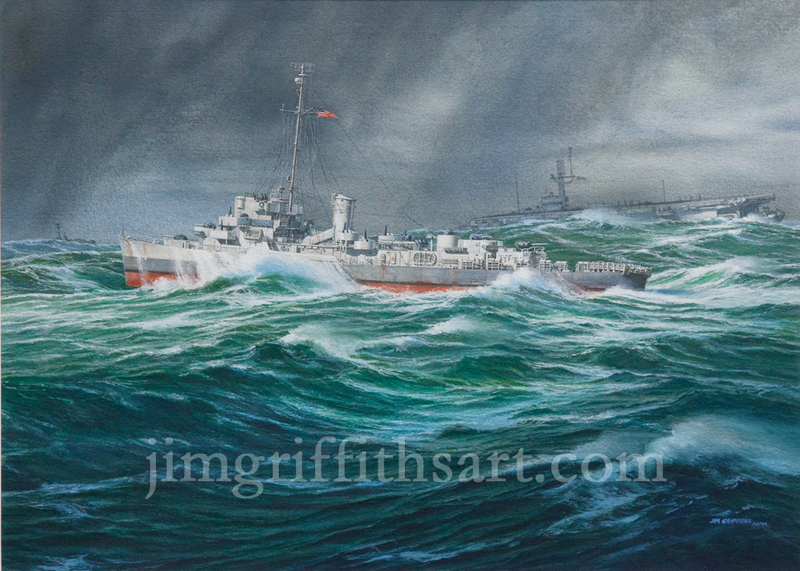 "Heading for the Aleutians", 10 x 19", USS Trenton (CL-11), Sept, 1944, Collection of the artist. 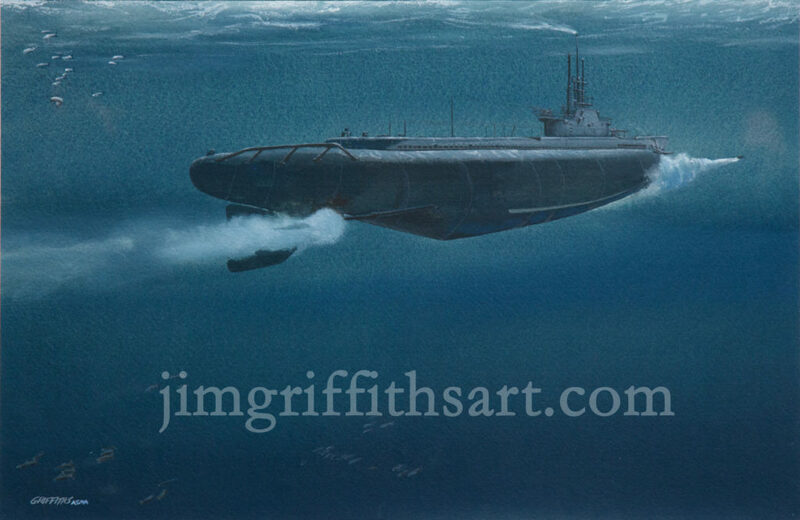 "In Like Company", 9 x 15", USN Gato-Class Sub, WWII, SOLD. 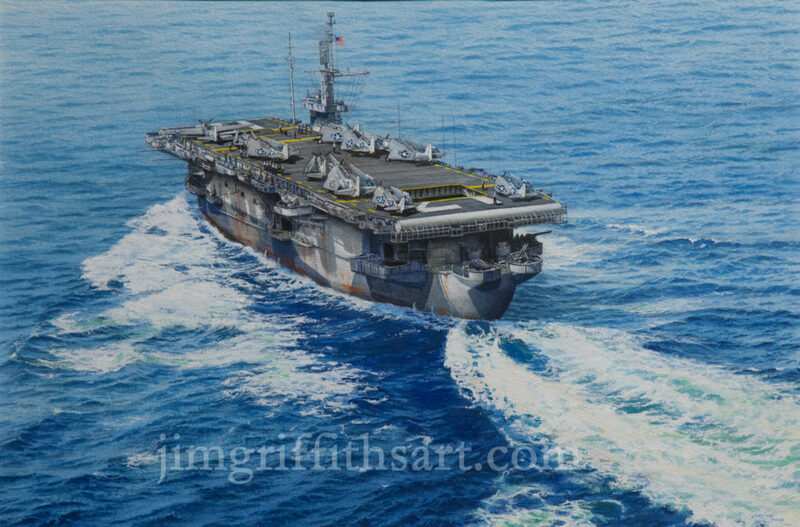 "In the Gulf", 11 x 19"' USS Tarawa (LHA-1), Persian Gulf, Jan, 1991 Collection of the artist. 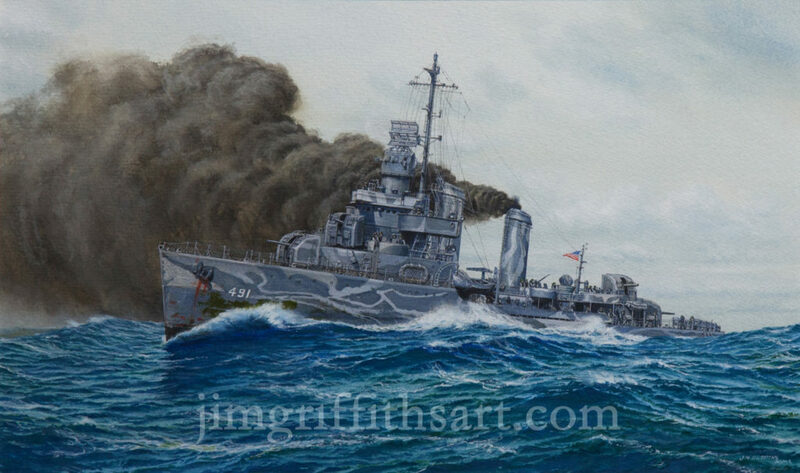 "Making Smoke", 12 1/2 x 19", USS Farenholt (DD-491), Summer, 1942, Collection of the artist. 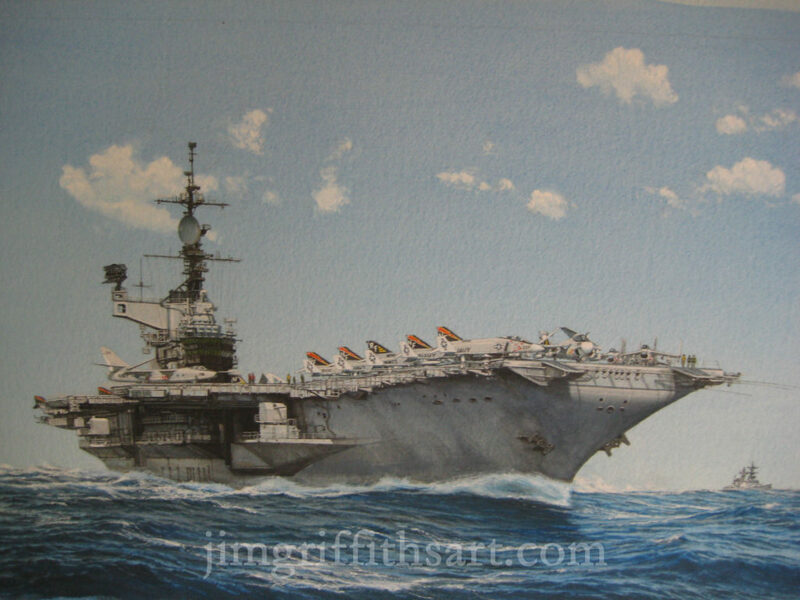 "Midway in '77", 12 1/2 x 19", USS Midway (CVA-41), 1977, Collection of the artist. 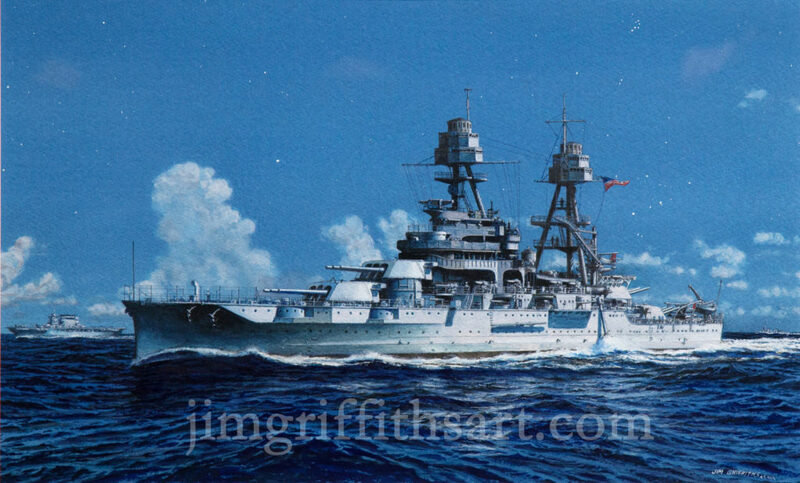 "New Mexico at Sunset",12 1/2 x 19", USS New Mexico (BB-40), Spring, 1919, Collection of the artist. 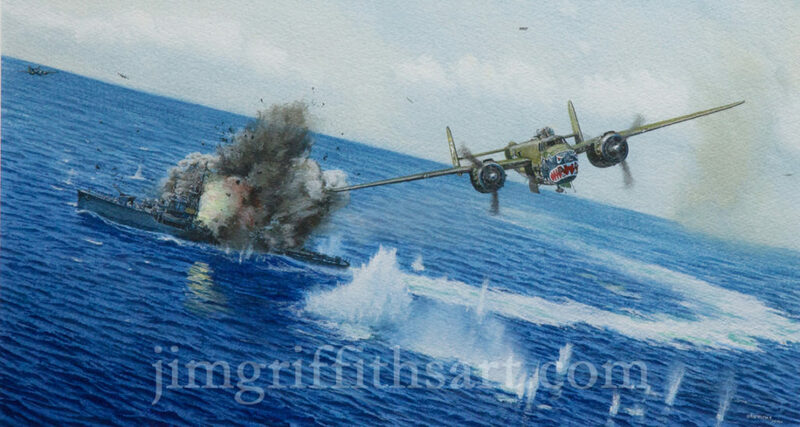 "No Quarter Asked; No Quarter Given", 10 1/2 x 19", 499th BS B-25s Attack I.J.N frigate, April, 1945, SOLD. 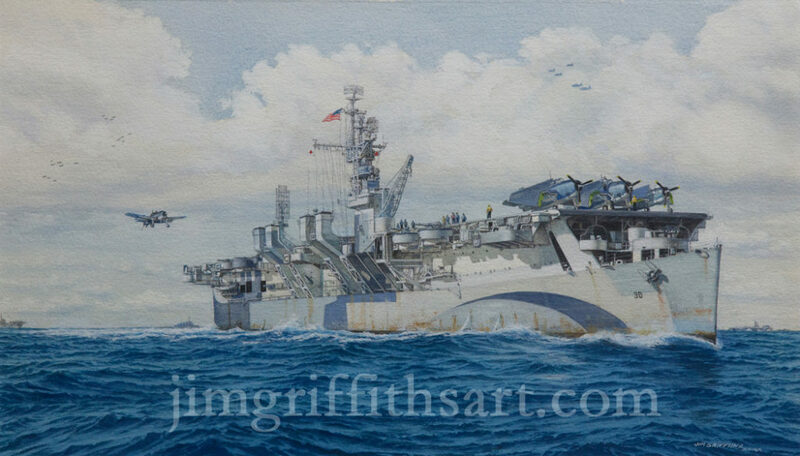 "On Her Last Patrol",13 1/2 x 27 1/2",, USS Block Island (CVE-21), May, 1944; Collection of the artist. 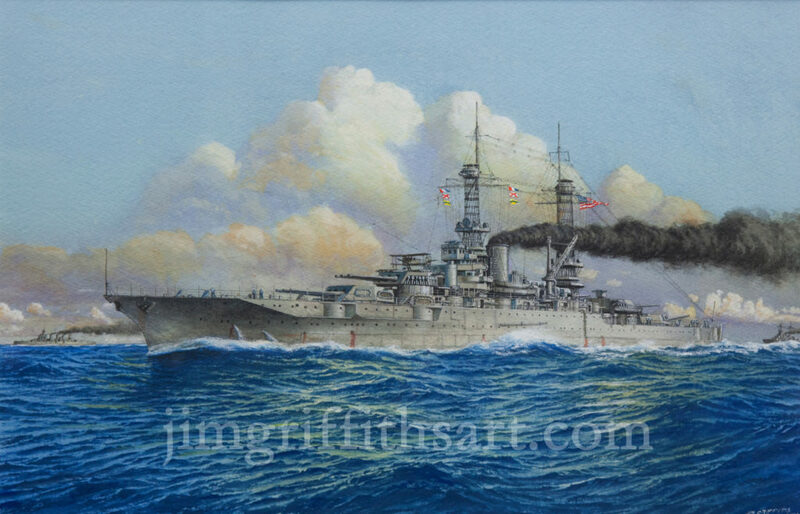 "On Her Way Out", 12 1/2 x 19", USS New Jersey (BB-16); SOLD. 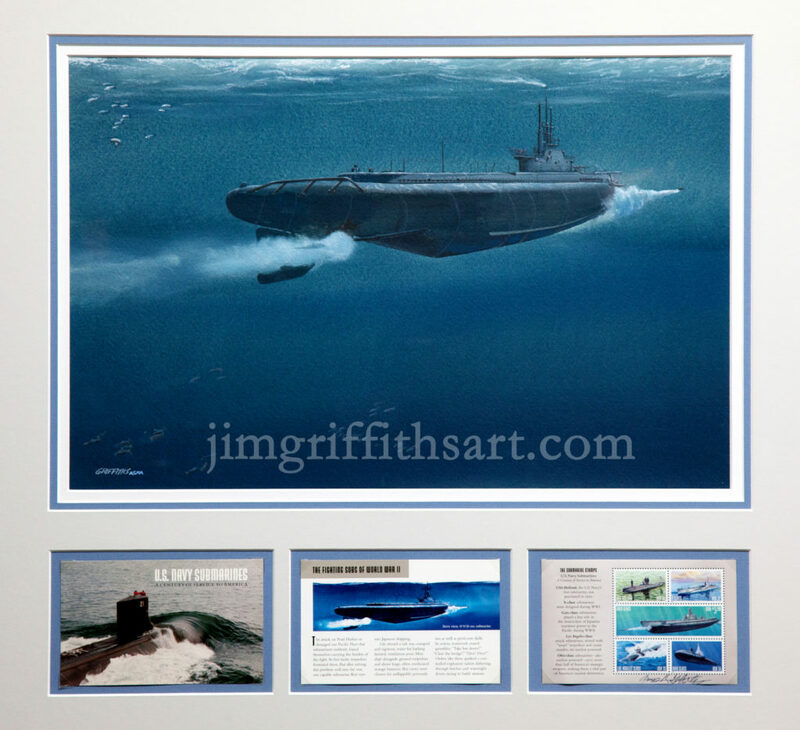 "One Away" with stamps, WW II USN Gato-class Sub, framed with USPS Submarine stamps; collection of the artist. "Ordeal of the Radar Pickets",18 3/4 x 31 1/4", USS Charles Ausburne (DD-570), Okinawa, June, 1945; Collection of the artist. 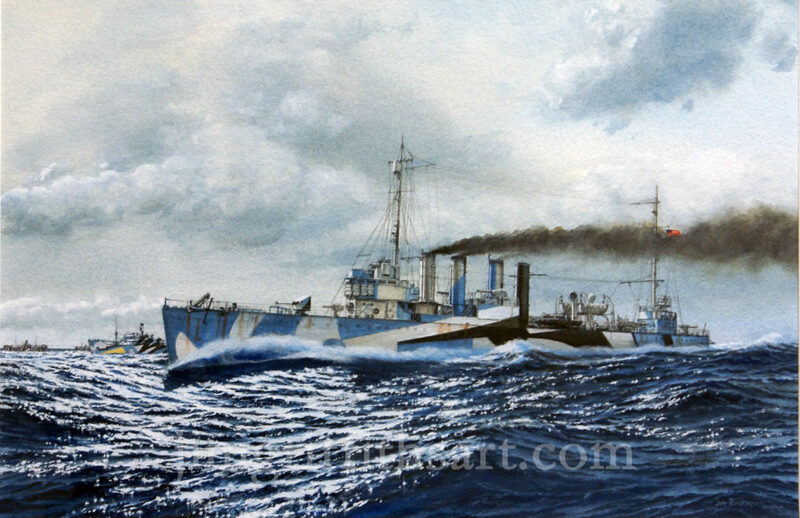 "Protecting the Convoy", 12 1/2 x 19", WWI Destroyer USS Dent (DD-116), September, 1918, Collection of the artist. 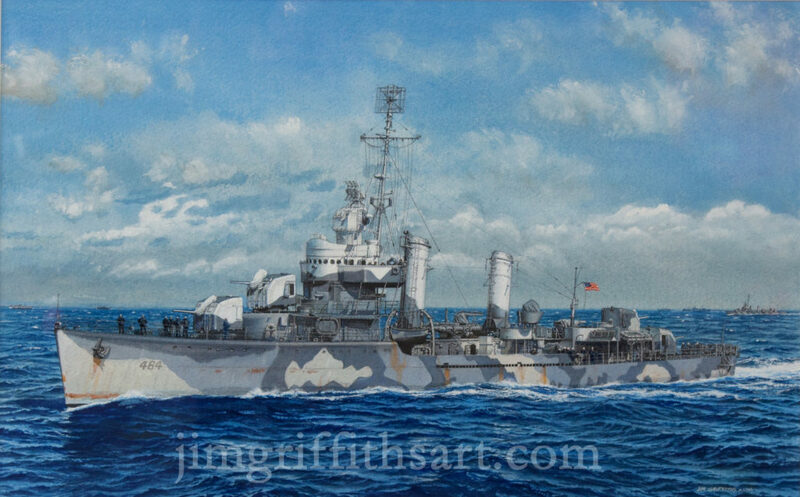 "Ready for Duty", 12 1/2 x 19", USS Boyce (DD-66), October, 1942; SOLD. 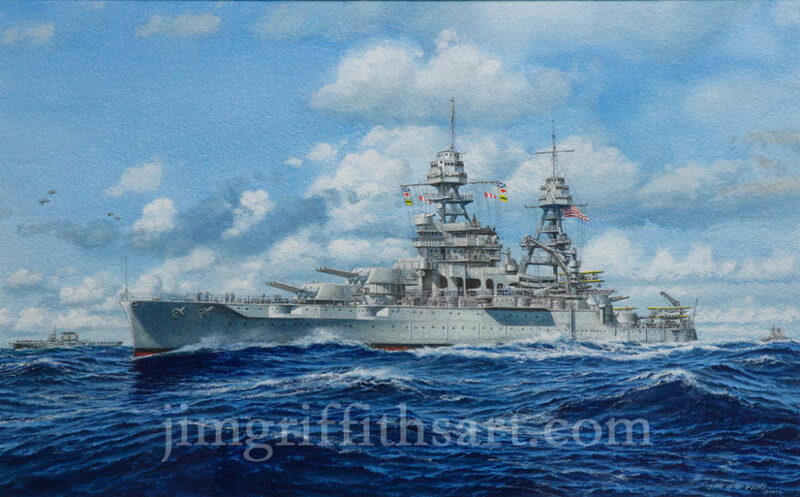 "The Arizona in '38", 12 x 19", USS Arizona (BB-39);collection of the artist. 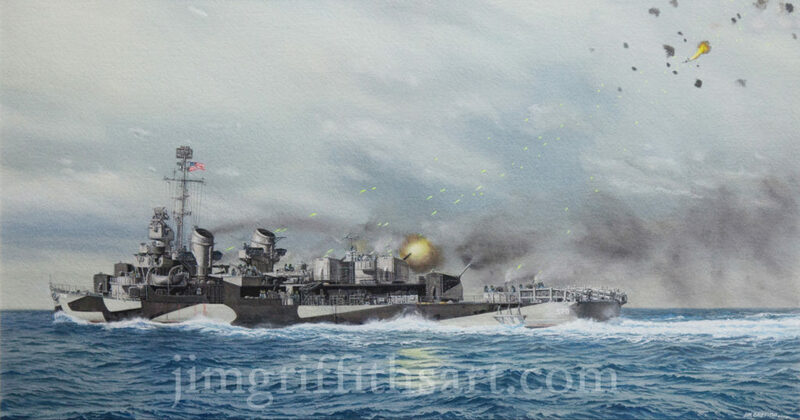 "The Barroom Brawl", 10 x 21 3/8", USS San Francisco (CA-38), 3rd Battle of Savo Island, November, 1942; Collection of the artist. "The Block Island at Casablanca", 14 x 25", USS Block Island (CVE-21), May, 1944; Collection of the artist. 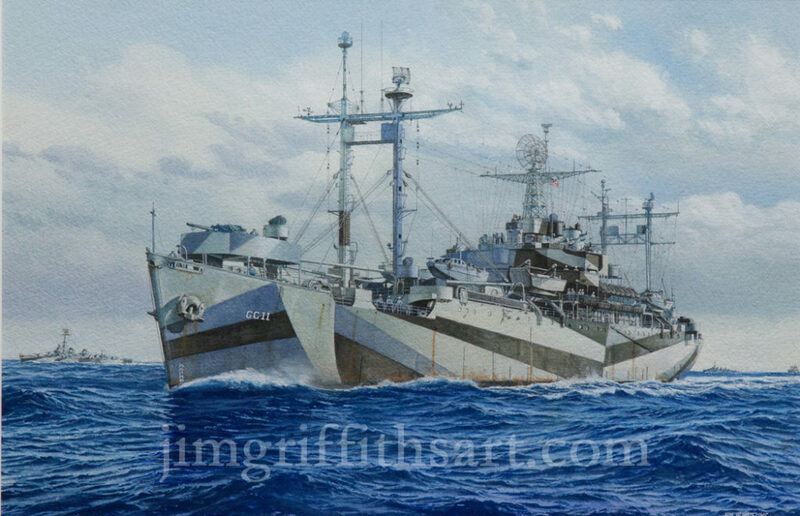 "The Block Island in '44", 12 1/2 x 19", USS Block Island (CVE-21) w/VC-55 aboard, May, 1944; Collection of the artist. 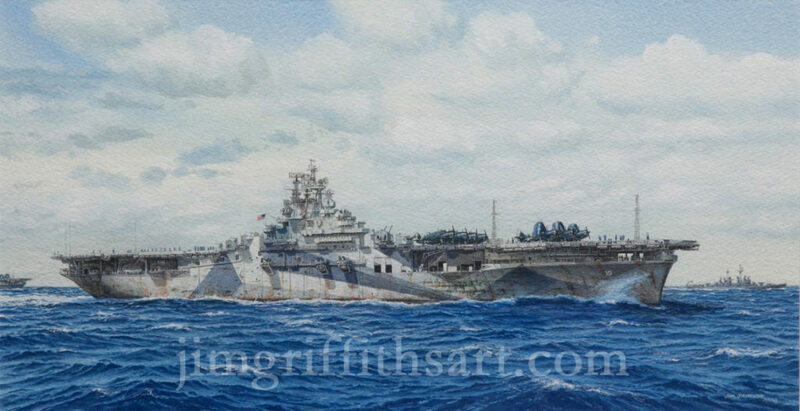 "The Block Island", 12 x 22 1/2", USS Block Island (CVE-21), May, 1944; Collection of the artist. 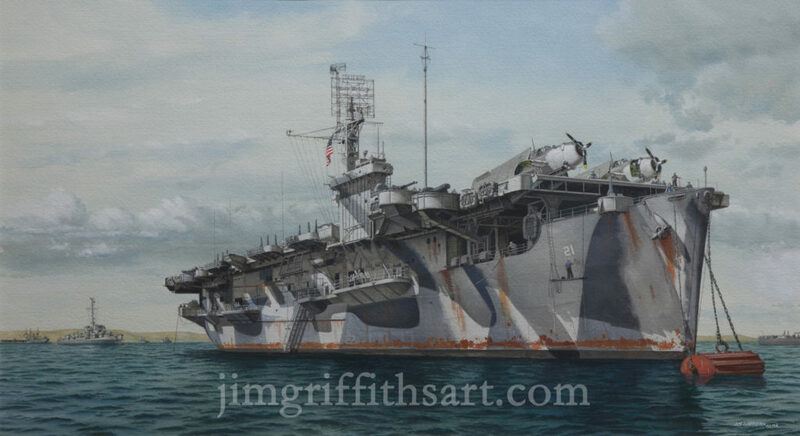 "The Fighting Lady", 10 x 19", USS Yorktown (CV-10), Winter, 1945 ;Collection of the artist. 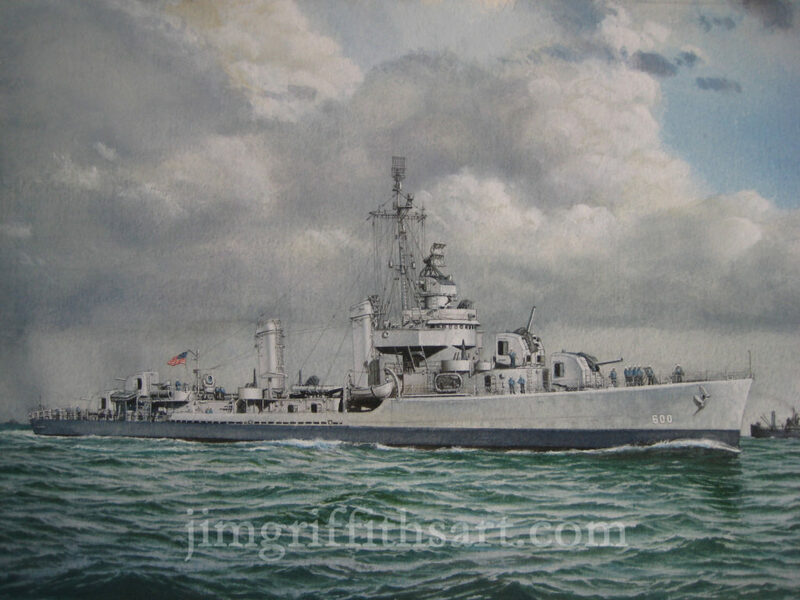 "The Hobson", 12 1/2 x 19", USS Hobson (DD-464), September, 1942; collection of the artist. 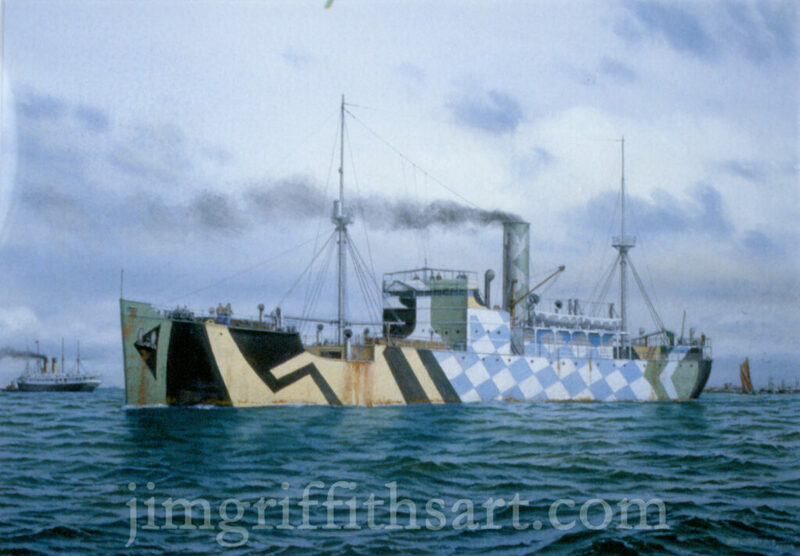 "The Leviathan in War Paint", 12 1/2 x 19", U. S. liner in WWI, Spring, 1918; SOLD. 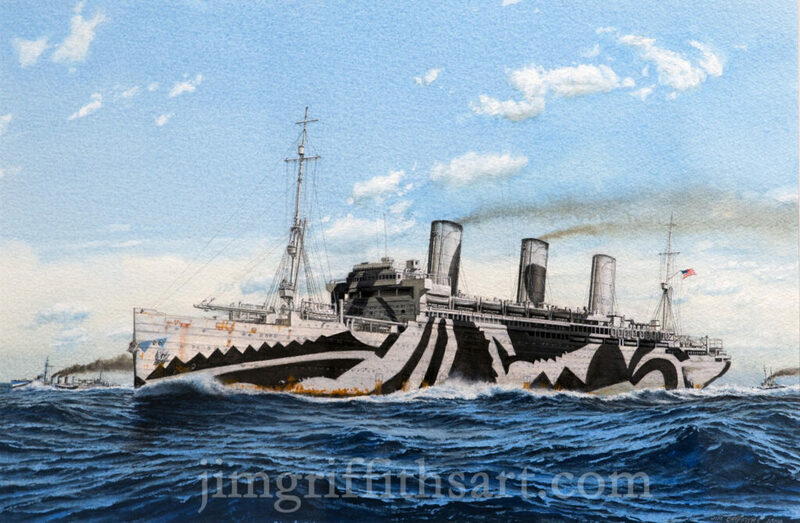 "The Mauretania by Moonlight", 12 1/2 x 19", Cunard Liner in Dazzle Camouflage, 1917; SOLD. 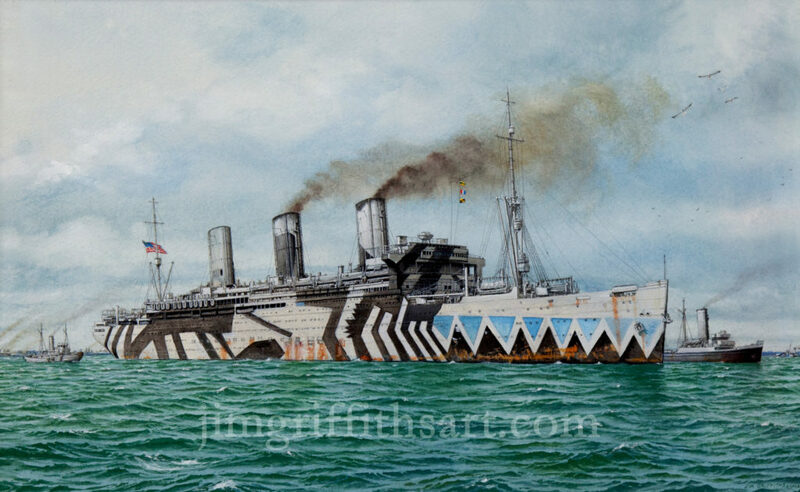 "The Mauritania mid-Atlantic",12 1/2 x 19", RMS Mauritania, 1917; collection of the artist. 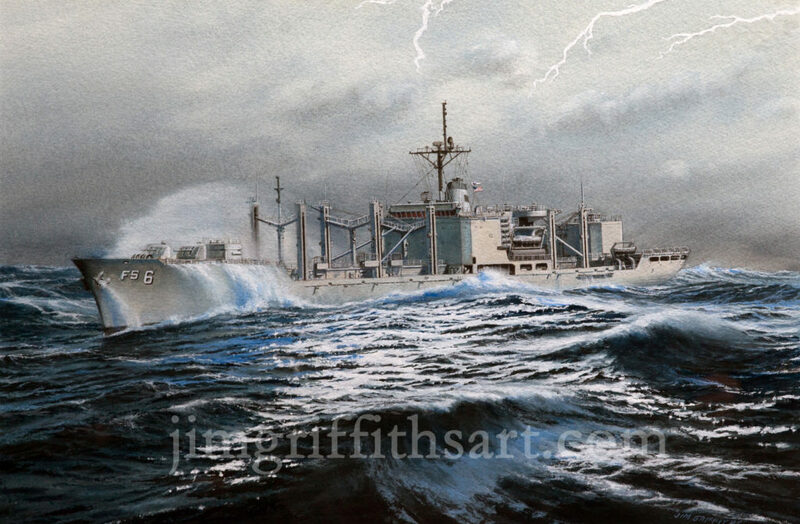 "The Other Enemy Was Weather", 16 1/2 x 23", USS Robert I. Paine (DE-578), 1944; collection of the artist. 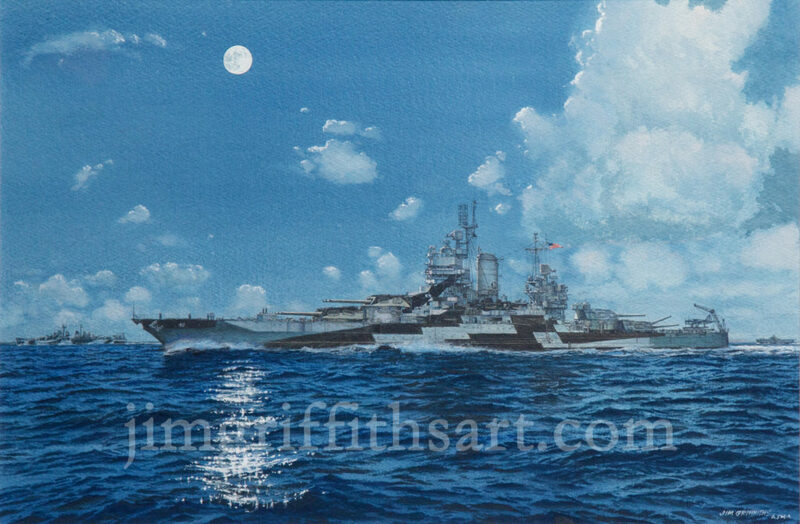 "The Pennsylvania Under Moonlight", 11 x 19 1/4", USS Pennsylvania (BB-38), mid-1930s; SOLD. "The Tuscaloosa by Moonlight", 10 x 19", Heavy Cruiser USS Tuscaloosa (CA-37), January, 1945; collection of the artist. 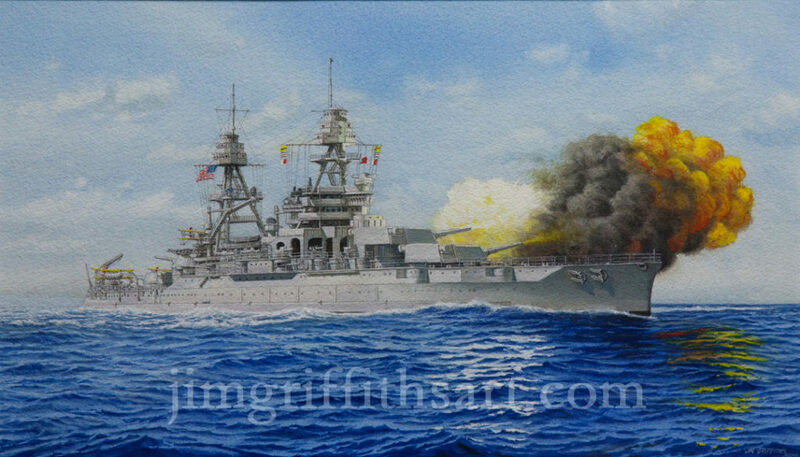 "Walk Softly, but....", 11 1/4 x 19", USS Arizona (BB-39), Mid-to-laste 1930s; collection of the artist. 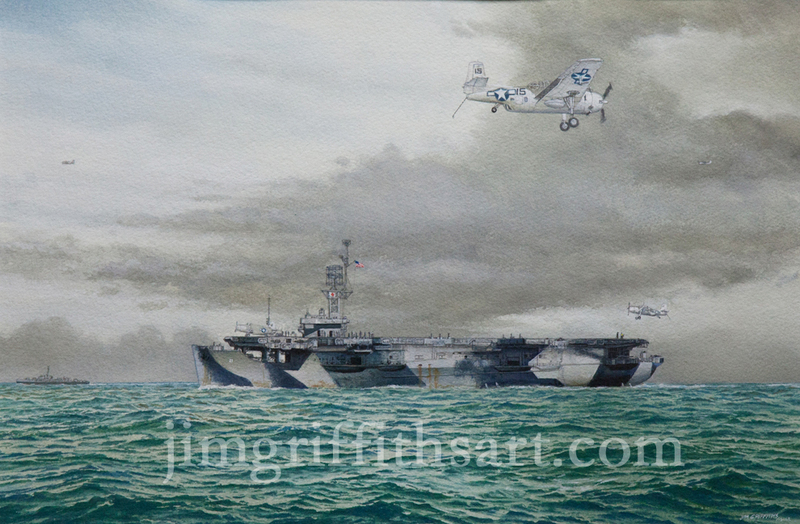 "With the Fast Carriers", 12 1/2 x 19", USS Yorktown (CV-10), March, 1945; collection of the artist. 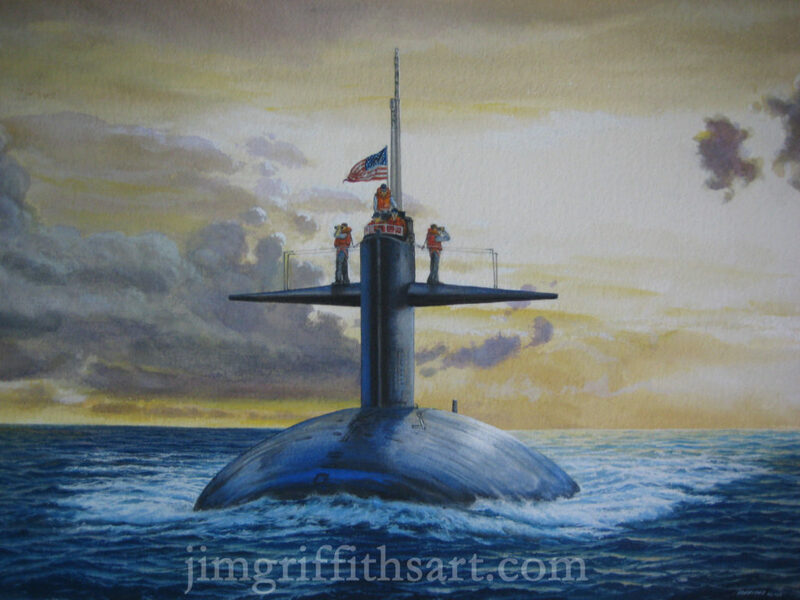 "One Away", 12 1/2 x 19", WW II USN Gato-class Sub; collection of the arrtist. 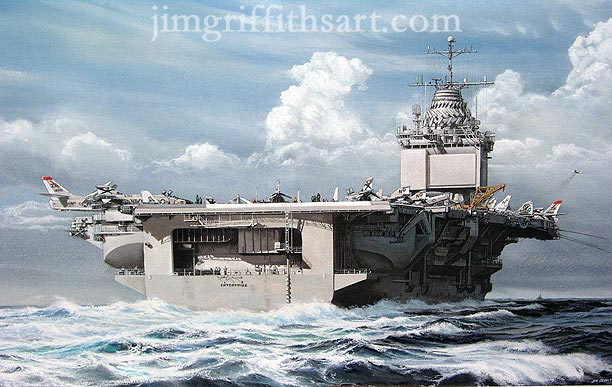 "On Yankee Station in '68" 14 1/2 x 26 3/4"; USS Enterprise (CVN-6), Spring, 1968, iff Viet Nam; sold. 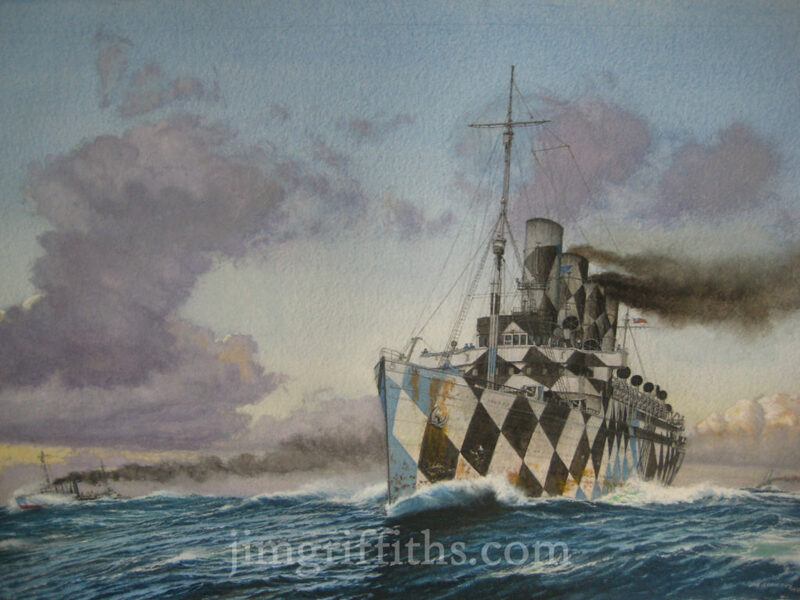 "Dazzled", 10 1/2 x 15"; HMS Polyanthus, WWI Q=Ship, 1947-1918; sold. 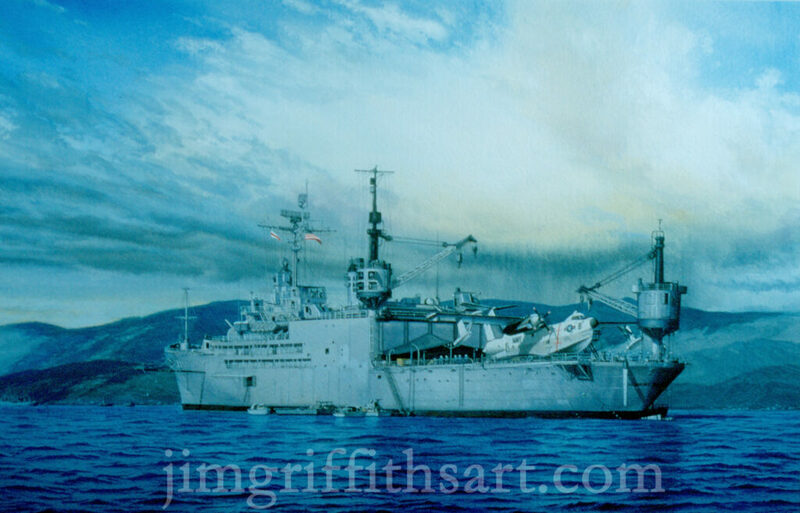 "Near Danang", 12 1/2 x 19:; USS Salisbury Sound (AV-13) in Cam Ranh Bay, 1965-1966; sold. 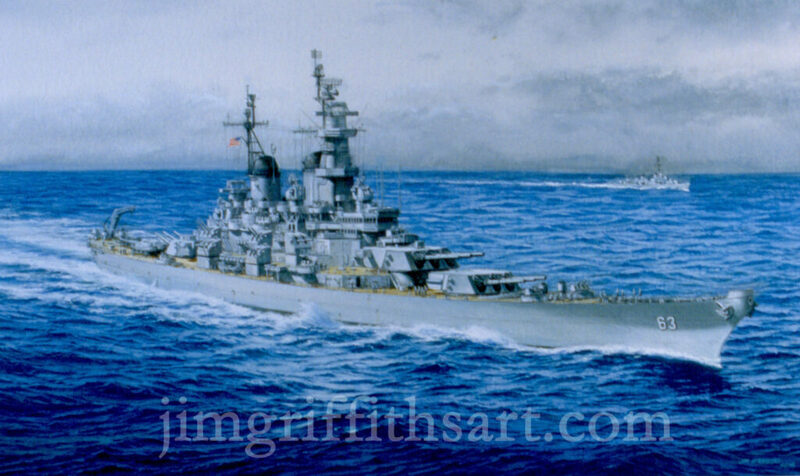 "The Missouri in '53", 11 1/4 x 19"; USS Missouri (BBB-63) Summer, 1953, off Hawaii; courtesy of the Jinishian Gallery. 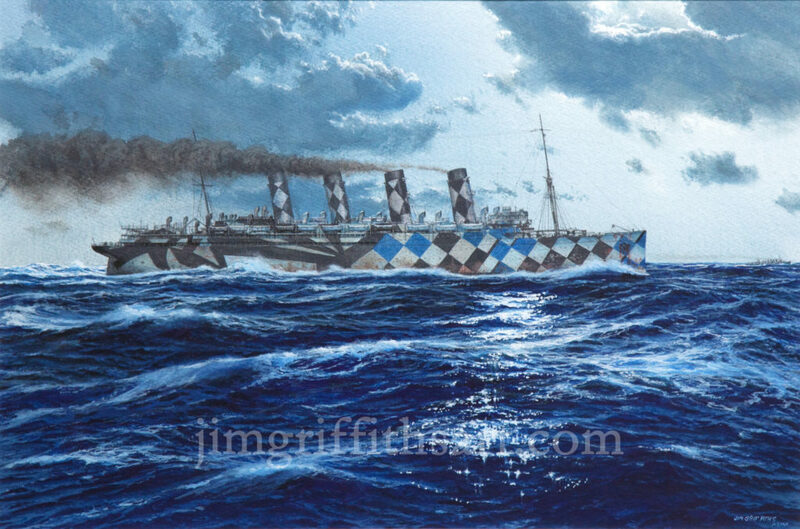 "Heading for the Fight", 12 1/2 x 19", U.S. Liner Lieviathan mid-Atlantic, 1918; sold.